Poor-quality breathing air that has high level of carbon monoxide (CO) can prevent oxygen from being absorbed by the blood⁣ ⁣and CO2 can cause headaches, impaired judgement and even loss of consciousnesses⁣. A History of Global Company Success BAUER KOMPRESSOREN can look back on more than a century of machine-building experience. Johann Bauer, blacksmith in Arnsdorf (Bavaria), established "Agricultural Machines Works" in 1888. In 1946 the BAUER Company started building compressors. 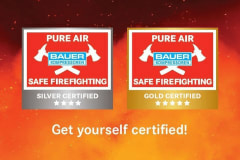 Today, BAUER is firmly established as a market leader in the high pressure sector. We pride ourselves on having contributed more to the development of breathing air compressors than any other company. The company biography will send you traveling through time. We will portray the developments in the company against the backdrop of concurrent historical events. Enjoy your time travels!